Nine Film & Television Pty. Ltd / National Nine Network. 2001. Executive Producer: Greg Beness. Nine/BMG/Gotham. GOTH00112. 2001. 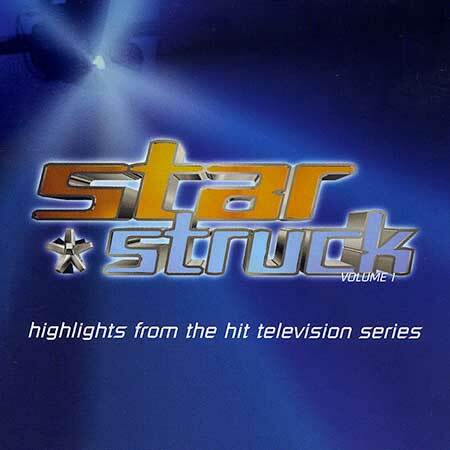 "STAR STRUCK HIGHLIGHTS FROM THE HIT TV SERIES - VOLUME 1". 01: BREATHING IN. Acquiesce. S. Semmens P. Camilleri. (Control). 02: W84U. Tommy Ryan. Tommy Ryan. (Control). 03: I'M OUTTA LOVE. Karina Chaves. Watters/Biancaniello/Anastacia. (Sony ATV Music/Universal MCA Music). 04: PRIDE. Kirstie Oates. K.Oates/D.Sandercock. (Control). 05: AMAZED. Michael King. Marv Green/Aimee Mayo/Chris Lindsay. (BMG Music/Universal MCA Music/Warner Chappell Music). 06: WHEN YOU BELIEVE. Pauline Curuenavuli. Schwart/Edmonds. (Universal MCA Music). 07: TODAY. Thread. Matthew Cairns. (Control). 08: I LOVE YOU. Harley Smith. Tammy Hyler/Adrienne Follese/Keith Follese. (EMI Music/Universal Music/Sony ATV Music). 09: DON'T QUIT. Katie Coogan Mason. J. Haynes. (Universal Music). 10: WORLD THAT'S MADE FOR TWO. Tim Reid. T. Reid (Control). 11: EASY. Rochelle Watson. L. Ritchie. (EMI Songs Australia). 12: SWAY. Sophie Koh. B.Runga (Warner Chappell Music). 13: EVEN WHEN I'M SLEEPING. Stephenie Grant. Manning. (Mushroom Music). 14: COME AGAIN. Burn. Liotta/Jessop. (Control). 15: BLACKBIRD. Roslyn Mahe. R. Henderson/M. Dixon. (J. Albert & Son). 16: TAKE ME TO RIDE. Rachel Gaudry. Rachel Gaudry. (Control). 17: HISTORY REPEATING. Martine Robert. Alexander Gifford. (Chrysalis Music Ltd).